To finish off Birthday Month here at the We R blog, we’re sharing a birthday gift bag featuring a sneak peek of one of our most popular tools that debuted at CHA this summer in Las Vegas. Take a look at how you can combine two of our hottest new tools to create decorative and unique wrapping perfect for any gift. Start by trimming your paper according to the directions on the Gift Bag Punch Board. Then, using your favorite 2 Edge Punch, punch a border across the edge that will end up at the top of the bag. Next, punch and score the bottom edge of the bag by following the directions on the Gift Bag Punch Board. Your paper should end up with the top and bottom edges as shown in the photo below. Fold the top edge of the bag down about 2 inches and punch holes as directed on the Gift Bag Punch Board. Unfold the top edge of the bag, then fold and adhere the gift bag together. Finish up by folding down the top edge of the bag and tying it with ribbon and a tag. Add a washi tape border down the front for a fun twist. Watch for four new Punch Boards (including the Gift Bag Punch Board) to start shipping this fall–just in time for the holidays! Hello. My name is Staci Taylor and I’m super excited to be We R Memory Keepers Guest Designer. Check out the project I created using We R Memory Keepers Storytime collection. 1. Use the solid side of the Goldilocks paper as the base for your layout. If you’d like, add some splatter of spray mist to give it some added color. 2. 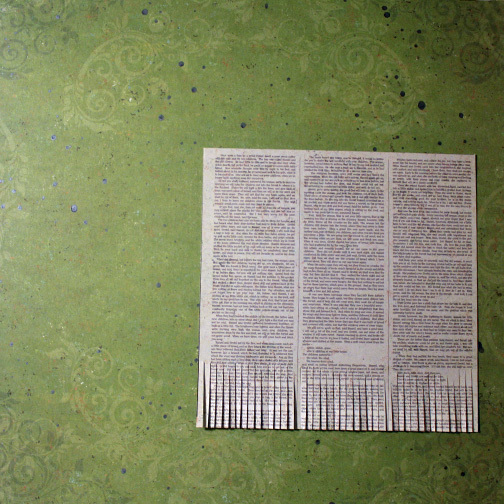 Cut the Frog Prince paper into the four already sized sections of 6×6. Choose one 6×6 section to layer your photos on top of. You can use decorative scissors to give it some texture (I used fringe scissors). 3. Pop out the inside of the embossed Once frame, and layer the outer frame on top of the 6×6 paper. 4. 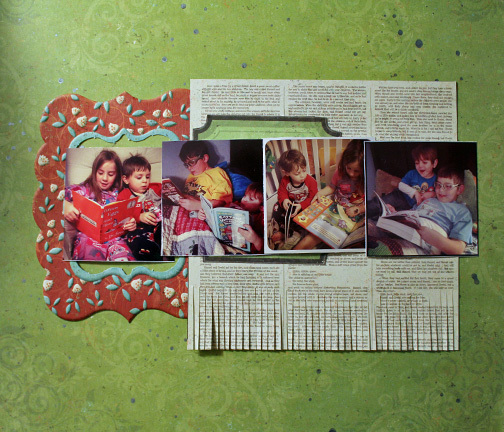 Begin layering your photos and other embellishments on top of the frame and 6×6 paper. 5. Cut strips from the Cinderella paper to layer over your photos, and add a piece of twine over the strips. Add other embellishments and journaling tags of your choosing. Use a corner rounder punch on all four corners. I used journaling cards from the Memo Albums Made Easy collection (plus one title card from the Tangerine collection), and simply trimmed the 6×4 cards to 4×4. I decided not to round the corners of those journaling cards, but to use the straight edges as a design element rotating them in various directions throughout the design. I punched some tabs out with my Bracket Tab Punch and then added the time of day with some mini alpha and number stickers from the Red, White, and Blue Paper Pack. Since I didn’t want to add any adhesive to my photos, I stuck the tabs and some washi tape accents onto the outside of the photo sleeves over the photos. That way if I want to remove the photos to use them for something else, I don’t need to worry about having anything stuck to them. …and there’s also a 4×4 nine square grid option available. Last of all, I wanted to share how I download and print my Instagram photos. My favorite option is http://www.instaport.me. This website allows you to select and download photos directly from your Instagram account to your computer’s hard drive. Then you can upload them and print them at your favorite photo printing service. You can print them as 4×6 prints and trim them, or some services offer Instagram prints as well. If you’re already an Instagram fan, or are soon to become one, We R Memory Keepers Instagram-friendly photo sleeves are the perfect way to document your camera-phone memories! 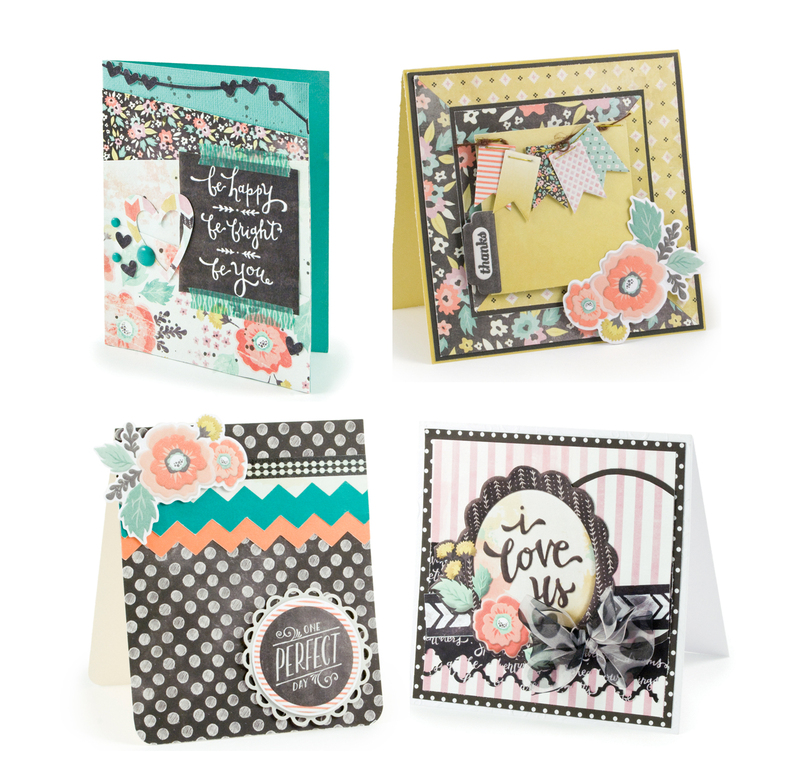 Today’s blog post is full of inspiration using We R Memory Keepers Chalkboard Albums Made Easy collection. We asked We R’s design team to share their day using this collection. Check out what they came up with. things I love about We R’s paper collections—there’s always a good balance of generic and themed patterns in each line so they’re very versatile. I punched the 6×6 papers with my Scallop Mini 8 Punch and then cut them in half. Then I cut some letters out of brown cardstock with my Cricut and added them to the banner, leaving one blank paper in between the words “happy” and “birthday”. I added some plain textured cardstock in between the patterns for some balance (love that We R always makes textured cardstock to match their paper collections), and then strung some brown baker’s twine in the loops to tie the banner up. Now I have a festive banner to put up for the boys’ birthdays so they don’t feel felt out of the fun, and it was easy to make–a win-win in my book! Hello! 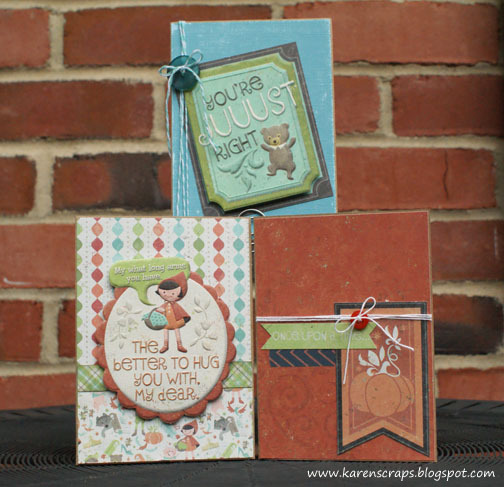 I am Karen Hunter and I’m so excited to be a guest designer for We R Memory Keepers. I was delighted (okay I squealed with delight) when I opened my package to reveal the super cute Storytime collection. This collection is so much fun and sweetly nostalgic. I made these 3 cards in a jiffy and wanted to share with you how quickly you can put your own together. Each of these cards begins with a 4×5.5 inch kraft card as its base. 1. Cut a 4 x 5.5 inch layer from coordinating cardstock. Mine had a light blue core, so I sanded it with a nail file for a bit of distressing. Adhere this to your card base. 2. Cut out the blue “happily ever after” sentiment from the “Cinderella” sheet, keeping a black frame around the blue box. 3. 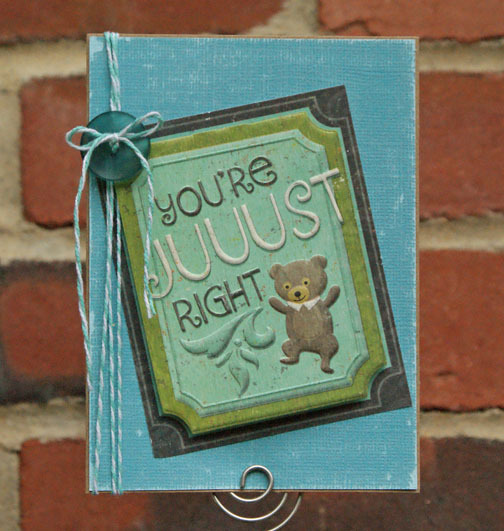 Trim off the hanger portion for the embossed die cut, “Just Right.” Use pop dots to adhere it centered over the blue box you just cut out. 4. Adhere this at an angle to the front of your card. 5. Wrap Aqua We R twine lengthwise around the front a few times and loop the ends through a coordinating button. Secure with a knot and tie a cute bow. 1. 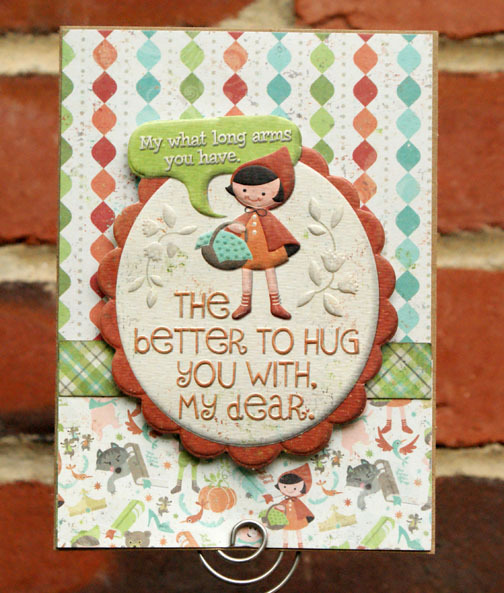 Use 3 coordinating patterns for this card. The top piece is 4 x 3.5 inches, the bottom piece measures 4 x 2 inches. The small strip is 4 x .5 inch. Adhere these layers to your base, with the narrow strip covering the seams of the other two pieces. 2. Trim the hanger portion from the “My Dear” embossed die cut. Use pop dots to adhere it to the center of your card. 1. Start with a piece of “Pinocchio” cut to 4 x 5.5 inches. 2. 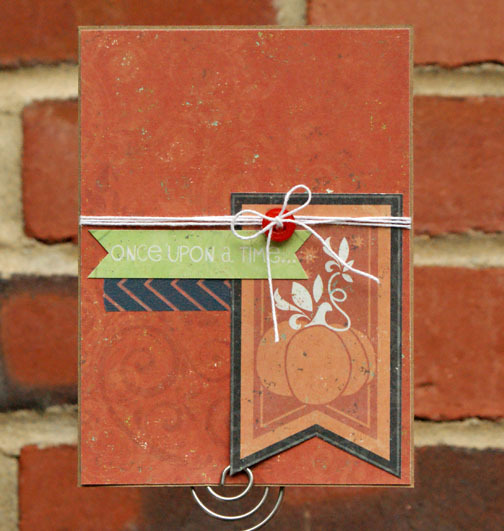 Add a few layers – mix in some Washi tape and elements cut from the “Cinderella” sheet, including the pumpkin banner. 3. Wrap some plain twine just above your element cluster and secure the ends through a coordinating button. Tie a bow. 4. Adhere this to the front of your card base. Thanks for taking a look and if you want to see more projects I made with this collection, visit my blog. In the video below I share some cool tips about my Favorite Things layout, and point out some of the Albums Made Easy system’s awesome features. 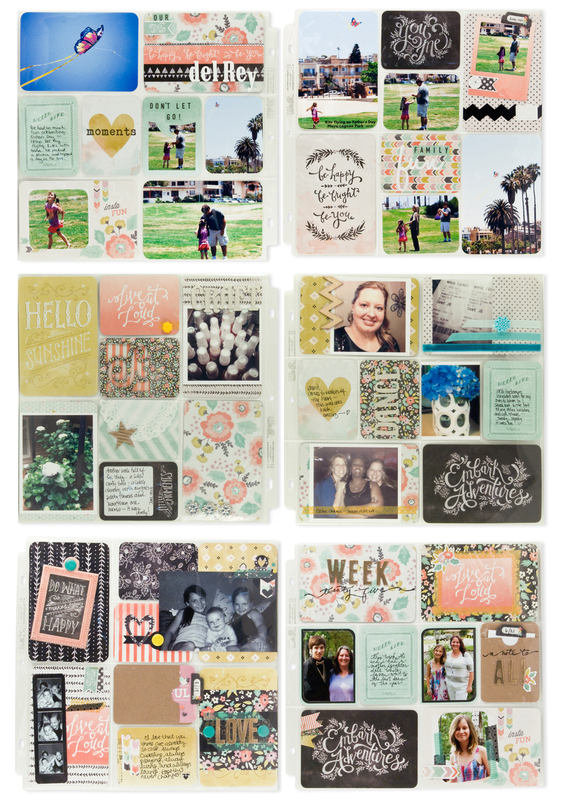 Check out all of the brand new Albums Made Easy Journaling Card collections that will be shipping over the next few months. Each of the six new paper collections has journaling cards to match, and there are three new journaling card collections that are exclusive to the Albums Made Easy system. Watch for adorable new die cut journaling cards perfect for layering over photos, and envelope sleeves where you can tuck in journaling or memorabilia. We have a very lucky winner. 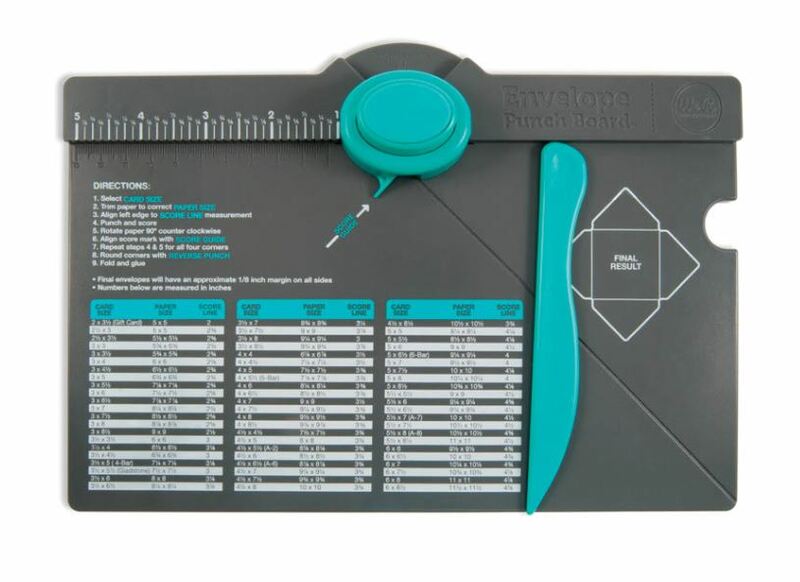 Help me congratulate Kelly Rohrbaugh Horn, who is the winner of We R’s Envelope Punch Board. Kelly please email me (jenny@weronthenet.com) your address so we can send your prize. We asked what you wanted to win and we got a great response that you wanted a chance to win an Envelope Punch Board, so that’s what we are doing. Post a comment and let us know what you’ll be doing this weekend and it will enter you to win. You can enter as many times as you want. If you could help us out and share this with your friends, we’d appreciate it.